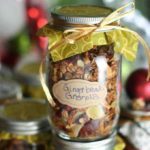 An easy and tasty Homemade Granola that doubles as great gifts! Preheat the oven to 350 degrees. In a large mixing bowl, combine the oats, nuts, salt, cinnamon and ground ginger. Stir to combine. In a separate large bowl, combine the oil, maple syrup, molasses (or honey) and vanilla. Coat large jelly roll pan (referred to as a Bun Pan) or two cookie sheets with non stick spray. Pour the oat mixture into your prepared pan and pour the liquid mixture over, combining well. (This might take a minute, be sure and stir well! )Bake for 20 minutes, then remove from the oven, give a good stir and put back into the oven for another 20 minutes. Remove from oven and stir in cranberries and ginger. Let the granola cool. The granola will continue to dry out as it cools. Don't panic if it seems too moist. Store the granola in an airtight container. It should stay fresh for 1 to 2 weeks. Store in the refrigerator for longer shelf life.